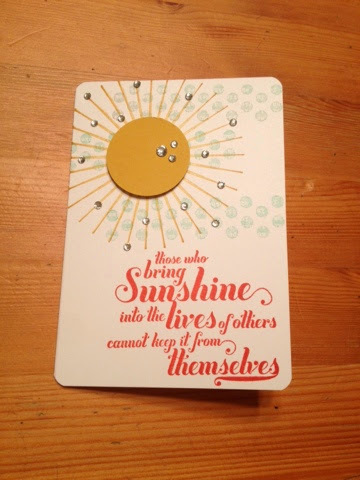 This is one of our Note Cards, and I rounded the corners with the Project Life Corner Rounder for a softer look. The Kinda Eclectic sunburst is accented with our Basic Jewel Rhinestones, and a punched circle in Hello Honey. The "clouds" are the circle stamp from Kinda Eclectic, in Island Indigo stamped off then stamped onto the card. The sentiment is from Feel Goods, stamped in Tangelo Twist. Just a little sunshine for your mid-week enjoyment! While you're there, log in and create an account and I will send you the newest Holiday Catalog coming out at the end of the month!